Discover all the piquant culinary stories! Abundance of vegetables and harmonious taste with low portion of fat are the qualities making this chutney a favourite side-dish. For everyone enjoying more piquant flavours, it is irreplaceable in numerous combinations, from practical sandwiches to obligatory barbecue. It is produced without preservatives and brings you a jar full of fibers, vitamin C and A and much piquant satisfaction! You can use it out-of-the-box, as a side dish to barbecue, sandwiches, hot-dogs, sausages or as an addition in preparation of various sauces, stews, soups and similar. 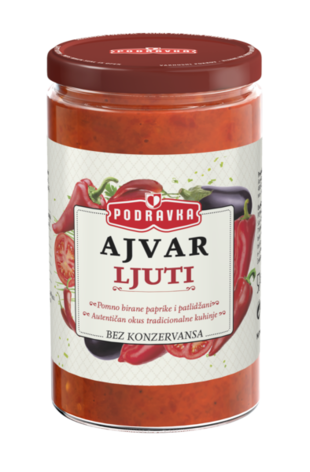 red pepper (76%), aubergine (12%), sunflower oil, vinegar, tomato concentrate (2,6%), salt, hot peppers(1%), sugar, spices.